This past week I have been saying good-bye to friends. It’s been tough… I realize how much I will miss the friendships I have built. The recent parting hugs have been the sweetest I have known. Last night, I went to Mo’s Diner, in Western Shore with the Friends of Oak Island Society past and present including the island investors/treasure hunter’s who were currently all over from the United States…17 of us including spouses, all in all. 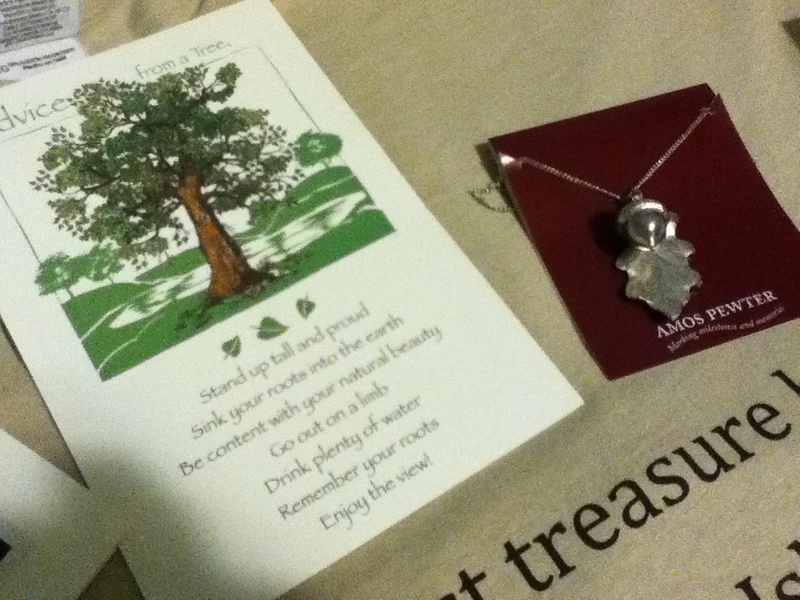 And then the sweetest thing… I was given cards and gifts… such wonderful treasures to take back with me to the UK. 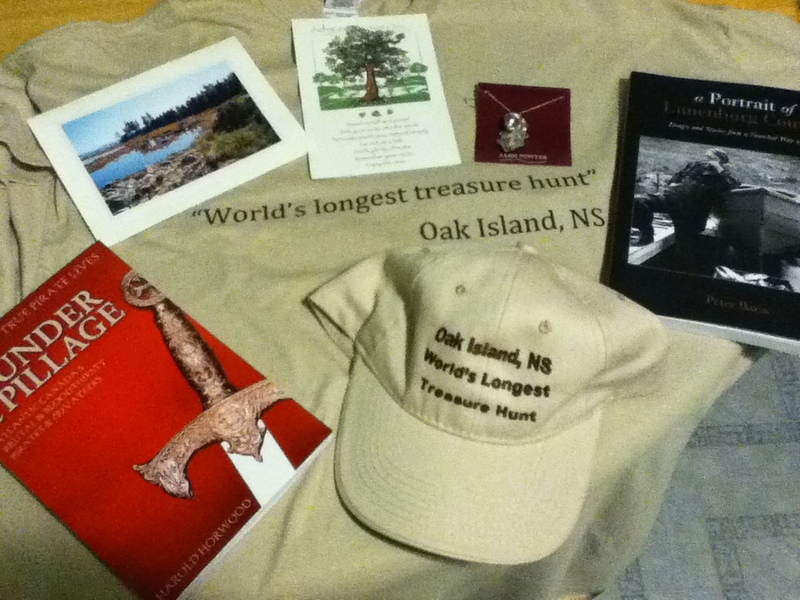 Hat, t-shirt, some local history books and the most beautiful acorn and oak leaf necklace from Amos Pewter..
And then the evening was over and I had to say good-bye to people I had worked with and become friends with for many years… it’s hard doing that. You always realize during the hugs how much you will miss them. A heartfelt message, I know how difficult goodbyes can be so hope you’re ok.
I’m thinking now of how sad I would be to leave all the people I take for granted on the peripheries of my life. I hate to think of leaving those in the centre of my life. You will be appreciated here too though, I’m sure of it. I, for one, want you to come and give a talk to the new Women’s Institute branch that I have helped start in our town. You would have absolutely loads to say that would interest our members. The WI has become young and trendy over here since you left but, as you know, has a proud heritage too. We live in Stockport, south of Manchester where there will be a very warm welcome awaiting you once you’ve settled down in Nottingham. I wish you all the very best with the move. I wish you well, Carolyn. In our house we call that a ‘beautiful sadness’. But, a new adventure awaits. New, wonderful friends to be made. You’ll be doubling your blessings across the ‘pond’. Good luck! All of us are cheering you on and can’t wait to hear about the new and exciting chapter that’s about to begin! Any change can be traumatic but quite often the transition can lead to a wonderful new situation. Try to be upbeat, not just for the kids but for yourself. You have made yourself friends in many places and nobody can take that away from. I’m tearing up as I read your good-byes…………I will miss knowing you are just one province away, as now, you will be a whole ocean away. I know you will be just fine in your new home, but I do hope you will be able to come back to Canada some day soon……we really need people like you and your ‘hobbits’ in our country. All the best to you, Carolyn. I’ll continue to follow you in your new adventures! Safe journey, Carolyn. Love and thoughts to you and your family. Canada will be poorer for your leaving, Carolyn and family. I look forward to hearing of your continued adventures in the land of your birth.